Occupational and Environmental Infectious Diseases, edited by William E. Wright, MD, MPH, provides a comprehensive overview of the recognition, management, and prevention of infectious diseases in the workplace. The Second Edition of this popular reference has been entirely updated and revised throughout. The addition of new material includes a completely new chapter on general travel medicine and prevention of illness, and includes expanded coverage of employee education issues and listings of Web resources. Rather than emphasizing theory, all chapters have been fully updated and enhanced to provide well-organized, practical, and relevant information. The emphasis has also been expanded to include more recognition that many infectious diseases are international or global problems. An ideal resource for occupational health practitioners, the primary care physician, and the generalist, this new edition is a valuable tool in the ongoing effort to provide a safe and healthy workplace. This handy reference is a vital resource for anyone working on the front lines of public health. 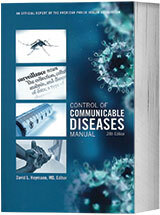 Reformatted and decreased slightly in size to ensure easily portability in the field, the 20th edition provides a quick reference for information including clinical signs and symptoms, modes of transmission, incubation periods, and measures for prevention and control. 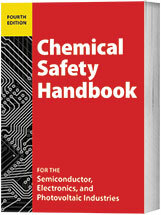 Covering 377 chemicals, including more than 30 new to this edition, this pocket-sized book offers a quick reference point for anyone working with chemicals in the electronics, semiconductor, and photovoltaics industries and reinforces safe behaviors long after the chemical safety class is over. Compact, clear, and concise, THE CHEMICAL SAFETY HANDBOOK provides a simple solution to minimizing risks and protecting employees. Written for operators, supervisors, ERT members, technicians, engineers, and Haz-Mat team members in the semiconductor, electronics, and photovoltaics industries. Accessible instantly in e-book format for cleanrooms in which paper books are not allowed. This 2010 volume approaches occupational and environmental lung diseases from the starting point of the patient who comes to the physician with respiratory systems. Chapters in the book are arranged by job or exposure and divided into five sections: personal environment, home environment, other indoor environment, work environment, and general environment. Each chapter is written by an expert in the specific topic and provides pragmatic information for the physician. Protocols for screening, testing, and identification of environmental triggers are reviewed. Cross-referenced appendices allow the practitioner to formulate appropriate investigations and diagnostic procedures. The frequency of asthma in the workplace and occupational asthma is one of the most prevalent occupational lung diseases. Featuring an international group of contributors and editors, the fourth edition focuses on the clinical aspects of management and treatment to provide a comprehensive, hands-on resource.